When I edit photos, I just pick the ones that I think are the stand outs (often only one or two) edit those, export and review what I’ve done. First, the recently transformed shrimp, fresh out of a scorching oil bath, sees potential solace in an a pool of amber liquid. He makes his move, hesitant at first, he throws himself towards the cool pool of dipping sauce that will surely quench the scorching heat that radiates in his coconut crusted core. He’s close, but there’s still a ways to go before he can dip his heated middle in the apricot flavored oasis. He pushes on, hoping a few more flips will land him in his sticky sanctuary. He pulls all the strength he can muster after his recent collision with the deep fryer and launches forward, landing cleanly in the middle of the delicious basin. It’s not enough, he wants more. He takes a moment to gather his strength. One more explosive shove and he’s there, right in the middle of the refreshing wellspring. He lets out a deep sigh. It’s ok to judge me for that. I’ve mostly spared you all from the incessant rambling of my haywired brain, but today has been a long day, you’ll have to forgive me. And my shrimp crazed ramblings. But I do hope you come back tomorrow, I’ll have a lovely cocktail for you that will go well with this delicious shrimp. Add 3 inches of canola oil to a pan, clip a deep fry thermometer onto the side. Bring the oil to 375 to 400 degrees, adjust heat to maintain that temperature range. Add the coconut and almond slices, pulse until well combined, add to a small bowl. In a separate bowl whisk the salt and flour. In a third bowl whisk together the egg whites and water. 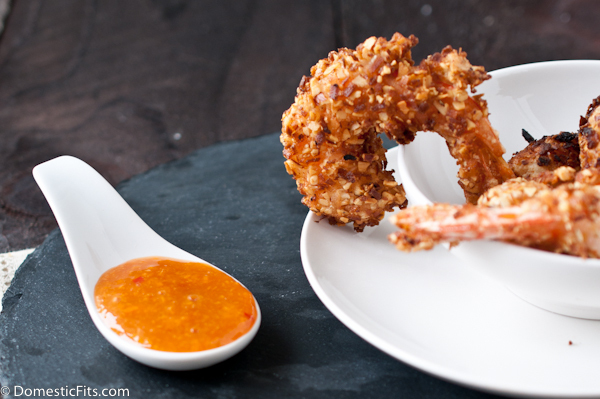 One at a time, dredge the shrimp in flour, then coat in egg whites, and finally roll in coconut mixture. Drop into the hot oil, fry until golden brown, about 3 minutes. Drain on a stack of paper towels. Add all of the sauce ingredients to a small food processor or blender, blend until smooth. 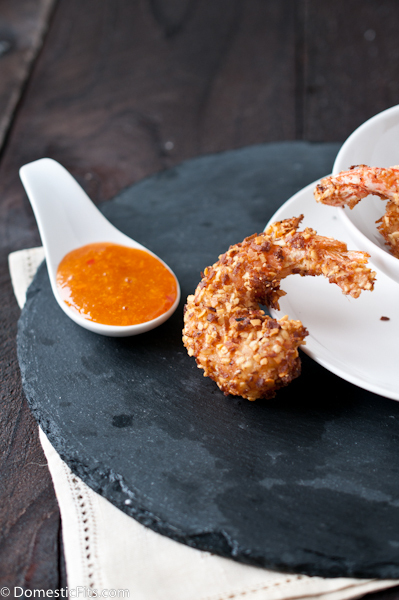 Serve shrimp with dipping sauce. This looks great! I am going to have to share this with my mom as a recipe that her and I can try when my dad and my fiance are out of town! LOL Love this shrimp story, Jackie! And now I wish they were in my kitchen! LOOOOOVE the sound of the apricot sauce. Dude, I love the story that these photos tell! My favorite is the one with the refreshing wellspring! I LOVE LOVE LOVE the shrimp story!!! 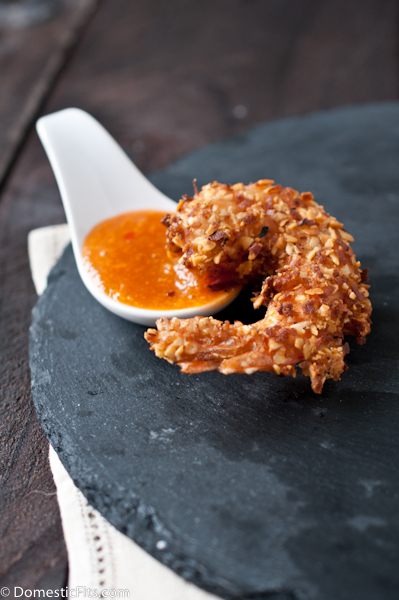 I also love almonds and coconut shrimp so this sounds divine!! LOL – um, keep it coming with the hilarious stories, girl! I could use a good laugh every day after work!! Adore this recipe – seriously, just want to sick my teeth into this! Hah! I love the story. I found myself saying “Go little shrimpy go!” And I LOVE these shrimp. 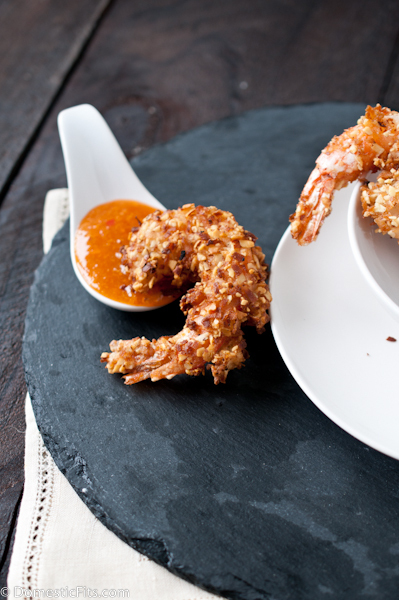 I’ve had a thing for coconut fried shrimp since I used to serve them all the time at a restaurant I worked at. Yours look better though. So much better. And that apricot dipping sauce? Hold me. You should write a children’s book titled the “The Transformed Shrimp”. I would totally read that! 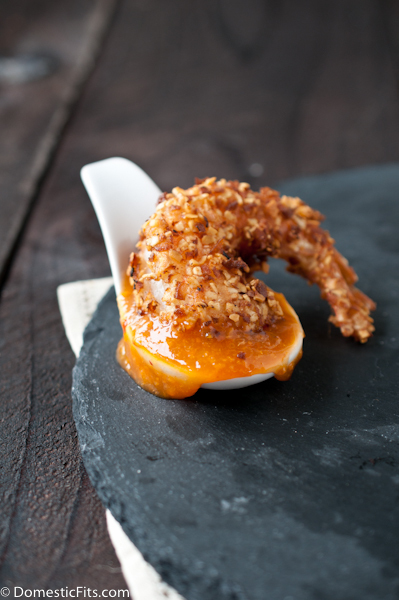 And this recipe reminds me of the shrimp I used to get at my favorite restaurant before it changed owners. Can’t wait to try this recipe. Haha! I LOVE the story the photos tell! That was awesome. I also love the shrimp. Coconut anything is what I am about!